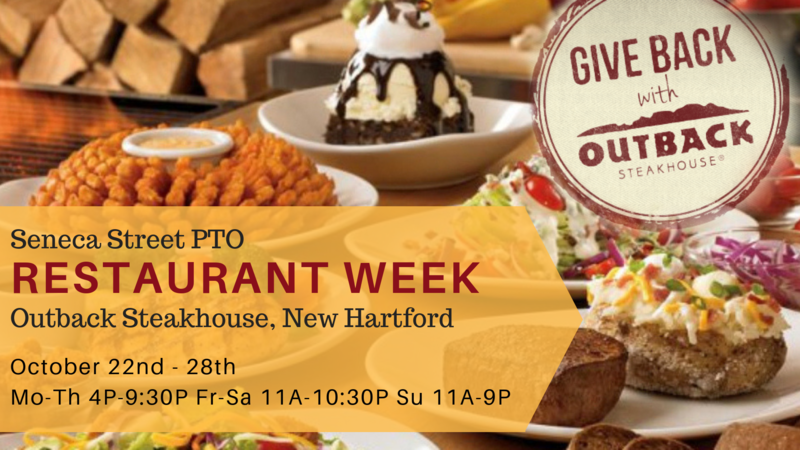 Outback Steakhouse in New Hartford has generously offered the Seneca Street PTO an entire week of fundraising! Just show the server our flyer, or tell them you’re supporting Seneca Street PTO, and we’ll get 15% of your check. As always, anyone can help us raise funds, so please share with your friends and family! Friday 10/26 11:00 a.m.-10:30 p.m.
Saturday 10/27 11:00 a.m.-10:30 p.m.
Sunday 10/28 11:00 a.m.-9:00 p.m.
Outback is located at The Orchard shopping center in New Hartford. It’s a great place to catch a movie or get some shopping done while you’re there! The address is 8655 Clinton St, New Hartford, NY 13413. Thank you for supporting Seneca Street School through our restaurant fundraisers. We hope you enjoy these events as an easy, fun, and tasty way of giving back to your school.